My little family in a Skyship over Switzerland. You need only two tools, a hammer and duct tape. If it doesn't move and it should, use the hammer. Was where he did fly. His expenses made him a legendary chap. Now 20 years on, our Rovert's retired. With a partner and daughter he is finely attired. So in search of adventure. It's back to the blimp. Lets all be proud, of this glorious shrimp. It is with much sadness that I must inform you of the passing of Airship Management Services, Inc. (AMS) President & Founder, George A. Spyrou on the 27th February 2010. The wide and expansive array of his colleagues and friends is a testament to George's affable personality and kind demeanor. He was a mentor, leader, luminary and friend to every member of the LTA community. It is George's wish that the AMS brand & company continue functioning through seamlessly. Therefore please accept this short note, as an assurance that George's legacy will be honored by ongoing endeavors to build, operate, & support the Skyship and Sentinel series of aircraft. Communications can be directed to the Greenwich office. My daughter with our horse Flicka. Lt. Cdr. G.HUNT served aboard various battleships and aircraft carriers mostly as a pilot from 1942 until 1962. He never talked about the war and was very lucky to survive 20 years in the fleet air arm. Gunner R.HUNT is in the second row from the top on the far right, he served with the Royal Field Artillery during WW1 and was based in both Afghanistan and Iraq. 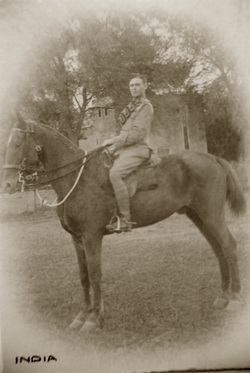 Gunner Hunt, note the riding whip and spurs. My daughter leading the first Eiger expedition. Resting in base camp after rescue by two Sherpas. Arguably the greatest explorer and adventurer the twentieth century produced, Bill Tilman was in his 80th year when he disappeared in Antarctic waters in 1977. The yacht on which he had set sail was ill-suited for the voyage but he had committed himself to go. His iron-willed integrity forbade any last minute doubts. Bill Tilman grew up, in the starkest sense, during the first world war where he was twice awarded the Military Cross. It was while farming in Africa between the wars that he met Eric Shipton with whom he developed a famous climbing partnership. 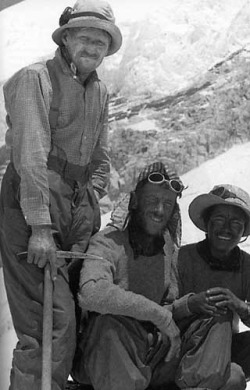 Together they explored and climbed in the remote areas of the Himalaya and Karakoram, as well as each playing leading roles in the British Everest expeditions before WWII. COL. T.E.LAWRENCE, The seven pillars of wisdom. The title comes from the Book of Proverbs, 9:1: "Wisdom hath builded her house, she hath hewn out her seven pillars" (KJV). Prior to the First World War, Lawrence had begun work on a scholarly book about seven great cities of the Middle East, to be titled Seven Pillars of Wisdom. When war broke out, it was still incomplete and Lawrence stated that he ultimately destroyed the manuscript. Later, during the Arab Revolt of 1917–18, Lawrence based his operations in Wadi Rum (now a part of Jordan), and one of the more impressive rock formations in the area was named by Lawrence "The Seven Pillars of Wisdom". In the end, Lawrence decided to use this evocative title for the memoirs he penned in the aftermath of the war. Mike always appreciated old RAF humour. Those of us who flew with him will always appreciate what a great chap he was and the way he lived life to the full, we also admire greatly the heroic job he did saving his passengers, on the very day he did not return for his pint of beer. Now very sadly, one of our blimps will always be missing. “jump now you scuppers, if you want to survive! Captain Mike steered the ship on the edge of no other. Initial copy copied from Lyndy Nerandzic in Australia, who will always be able to stand proudly in a gap left in our pilots ranks where her husband once stood. When all airship pilots line up each year to remember Mike not returning, we will stand outside the pub in our lineup for the senior captain, but we will always leave Mike a space in the line, whilst he stays for that last cold Burton beer.